« Maple Syrup Festival 2015! The irony is we haven’t officially begun Fourth Grade, until Easter. We school year round and begin anew with the Spring. But leave it to my oldest child to speed ahead and be inspired. As we wrapped up the Third Grade year with review and making sure our Main Lessons Books were looking good, I would talk with Little Eagle about Norse Myths and the Vikings. He knew I was studying and preparing to teach him. I did tell him that upon meditation I would like for him to spend some time in the wood shop with dad creating tools. I knew he was interested in tool-making, so it makes sense to gear it toward the Vikings and Norse Mythology, right! Little did I know my husband also thought it was time that one boy came with him, on a weekday. Each week the older two boys will take turns in the shop on a business day. This means they will get to spend time one-on-one making things. They may also run errands with Papa to one of our many clients, or interior designers. Otherwise, it is a chance to spend time with dad in the shop creating. The first project Little Eagle did was an upcycled knife, with a wooden handle. He did the research and wood burned a Viking style W on the handle. The wood is purple heart, with a grapeseed oil finish, and a wood plug holding the metal and wood together. 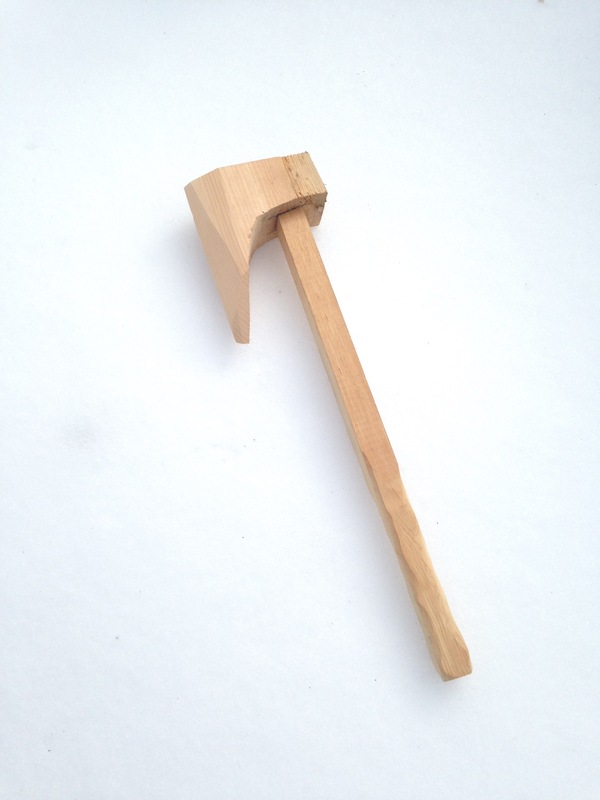 He also put together a killer Viking axe, all wood. I had to wait until the next day to see it, because he left it at the shop overnight, so the glue could dry. Here it is. I think Fourth Grade might be A LITTLE fun. I’ll keep you informed.